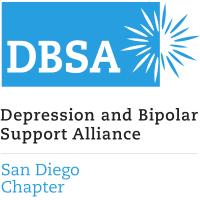 is the San Diego chapter of the national DBSA (Depression and Bipolar Support Alliance). We are a peer-facilitated support group of people who support one another on our road to wellness. We include those diagnosed with mood disorders, their families and friends, and anyone else who seeks to learn more about depressive and bipolar mood (affective) disorders. DBSA San Diego emphasizes education in all areas that relate to bipolar (manic depressive) and depressive illnesses, including the identification of community resources available to help those affected by these disorders. Our group is organized and run by volunteers, and sponsored by Drs. John R. Kelsoe, M.D., Eric B. Raimo, M.D., and Colin A. Depp, Ph.D. The mission of DBSA San Diego is to provide hope, help, support, and education to improve the lives of people in San Diego County who are living with mood disorders. We meet every Monday and Thursday from 6:00pm to 8:00pm at the VA San Diego Medical Center in La Jolla for support group sessions, where people get to discuss issues related to their mental health diagnoses with others who have dealt with similar issues. For more information on our meetings, see our Meetings page. Once a month, DBSA San Diego presents guest speakers from the San Diego health and social services community. Some of our past speaker presentations are available on our DBSA San Diego YouTube Channel. For information on our upcoming speaker events and discussions on previous speaker events, see our DBSA San Diego Speakers Blog. Through education and awareness, many people find that they are better able to cope with the pain of their illness with dignity and insight. We invite anyone affected by mood disorders — mental health consumers as well as their family and friends — to attend our meetings and to take advantage of the many resources available through this Web site. For more information on the many resources available here, see our Resources page. After most DBSA San Diego meetings, a dozen or so attendees get together in the cafe section of the local 24-hour Ralphs market — everyone is welcome, of course — to eat, drink, and socialize at a more casual level. Some of our recovered friends enjoy the Ralphs tradition so much that they skip the meeting and just show up at Ralphs. We also have four or five Summer Potluck Picnics at Mission Bay Park, as well as our Spring Fling and Thanksgiving Feast at Hometown Buffet, and a Holiday Potluck Party during the winter holiday season. DBSA San Diego is a 501(c)(3) non-profit organization and, as such, welcomes charitable donations from the public. Gifts are 100% tax-deductible. If you'd like to donate online, simply click the DONATE NOW button that is found in the upper right corner of every page. Or if you prefer, you can write a check to DBSA San Diego and include your postal address so that we may send you a receipt in the mail. For more information on donating to DBSA San Diego, see our Donate page. Although DBSA San Diego support group meetings are held in the VA San Diego Medical Center, our organization is in no way affiliated with any government or military organization nor is government or military affiliation a requirement for participating in our our organization. Furthermore, DBSA San Diego is purely secular in nature, that is, it has no association with any religious group, and religion is not discussed in our meetings, though of course we welcome members of all (or no) religions to our meetings and other activities. DBSA San Diego does not dispense medical advice; if you have a medical concern, please contact a qualified mental health professional. We cannot take responsibility for information that you obtain from links on our site. Copyright © 2003-2019 DBSA San Diego. All rights reserved. dbsasd1 Site problems? Email the webmaster.